Contact lists are created electronically -You don’t have to keep a huge phone book to store all your clients’ information but you can access them straight from your computer, saving you valuable time. 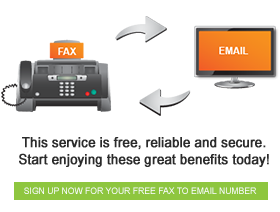 Detailed logs of fax communication –You have detailed logs of exactly when faxes came through and were sent. When you use these services you will never be caught in a “he said, she said” storm because you can simply pull out accurate mail logs. Mobile text alerts– Since this service is available to you from wherever you are in the world as long as you have an active internet connection, and it is also available on mobile devices. Each time you receive a fax message a notification will be pushed onto your phone the same way it happens when you receive emails. Fax numbers that are never busy –You will never be unable to send someone who has a fax to email account fax messages because the number is engaged. The line will not be clogged because everyone receives their fax correspondence in their dedicated email inboxes.